With the postseason picture coming into clearer focus, the high school sports season moves into its final week with the girls’ city series finale opening the week and the state wrestling tournament closing out the action. Only three of the area’s basketball teams have qualified for the postseason so far. Two others remain alive, while three appear to be out of the tournament mix. 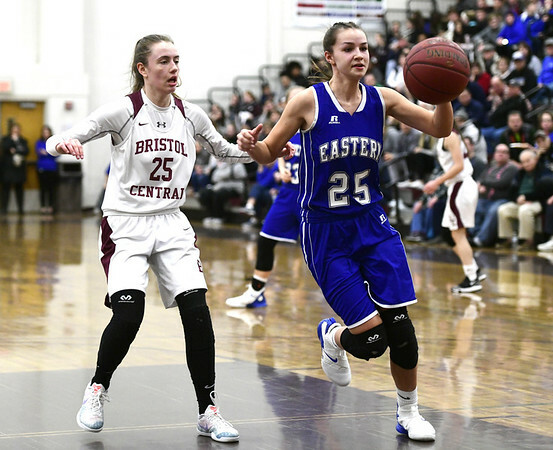 Bristol Eastern will host Bristol Central tonight in the girls’ city series matchup. It will likely be the final game of the season for the Rams, who have quadrupled their win output of a year ago, but will most likely fall short of the postseason. Eastern will be the heavy favorite to continue its dominance in the series, but the Rams have shown a resurgence, winning three of their last six games, and should give the Lancers a better test. Bristol Central still has a remote chance of sneaking into the 32-team Class L field if it can pull off a win tonight and get some outside help. Eastern’s season will continue after tonight’s contest, as the Lancers will begin play in the CCC Tournament on Thursday before moving on to the CIAC tournament later this month. With one game left to play, the Lancers are currently seeded 10th in the CCC field, but could move up to earn a home game in the first round with the right but highly unlikely combination of outcomes of other CCC games this week. The Class L state wrestling tournament gets underway Friday afternoon in the Bristol Central gym. Bristol Eastern, the two-time defending state champion, is one of the favorites in the event that will conclude on Saturday afternoon. Bristol Central also hopes to have several wrestlers challenge for medals in the event. St. Paul and Terryville will compete in the Class S event at Windham. St. Paul’s boys basketball team joined the St. Paul girls in the postseason mix with their win over Watertown last week. The Falcons have only one game this week, against Holy Cross on Thursday. The St. Paul girls wrapped up the regular season last week with an 18-2 record and will be a top-four seed in the Class S tournament. They will begin play in the NVL tournament later this week. Bristol Central boys basketball is the closest of the remaining area teams to postseason qualification. The Rams need one more win and will host Plainville on Tuesday before traveling to West Hartford to take on Hall on Friday. Plainville wrapped up at least a share of the CCC South Patriot Division title with their win over Eastern, but the Rams will also claim a share if they can win their remaining two divisional games. The Central boys are currently on the outside looking in at the CCC Tournament field, but would claim a spot if they can close out the season with a string of wins. Bristol Eastern’s tournament hopes ended with the Lancers’ 10th straight loss on Saturday. Eastern still has three games left on the schedule and hosts Middletown on Wednesday and plays at Conard on Friday. Terryville’s girls have been eliminated from tournament consideration. The Kangaroos close out the season with three road games this week. Terryville is at Litchfield today, at Gilbert on Tuesday and at Housatonic on Thursday. The Terryville boys are still alive but need to win three of their remaining four. The Kangaroos visit Wolcott Tech today and host Gilbert on Tuesday and Housatonic on Friday before closing out the regular season against Lewis Mills next week. The Bristol co-op swim team remained unbeaten in the CCC South with a pair of wins last week. They will look to keep that streak alive with a trip to Plainville on Tuesday. Bristol Central’s boys finished sixth in the indoor track Class L state championships last week and could send several athletes on to next week’s State Open. Terryville’s Chris DeForest was second in the Class S 3,200-meter race and will also advance to the State Open. Posted in The Bristol Press, Bristol Central, Bristol Eastern, St. Paul, Terryville on Sunday, 10 February 2019 21:53. Updated: Sunday, 10 February 2019 21:56.